I made my overdue visit to BÃ¤co Mercat one cold-for-LA, weekday evening. I stationed at the full bar, in full view of the construction of both BÃ¤zeracs I ordered for the duration of my meal. The red tinge of the storefront neon sign brought a welcome warmth, and it proved quite the perfect setting in which to enjoy each of the small plates that gradually came out. They are all essentially small plates with big flavor. It sounds so simple, but only Josef Centeno can effectively achieve that. You could also oversimplify the BÃ¤co as a sandwich, but that would be the same atrocity as calling its flatbread a mere pita. I haven’t had any of the other BÃ¤cos (an offense to be corrected over many future return visits), but the beef tongue schnitzel variety was absolutely divine. The combination of breaded beef tongue and spicy harissa with smoked aioli were like bites of heaven. And there are no words for that secret flatbread, in which Centeno uses “different fats and lebni” – you have to try it on your own. It’s more moist and dense than typical flatbreads while affording a fluffy consistency. I wanted to finish the whole thing right then and there. (Alas, I had ordered too much food.) If I had to move downtown for my daytime vocation, the lunchtime BÃ¤co alone would be a huge consolation. 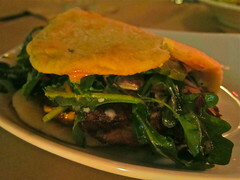 The thinly sliced pork headcheese with capersÂ was a great way to start off. 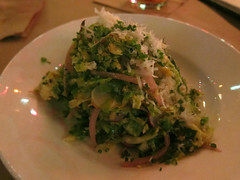 I also really enjoyed the brussel sprouts, which were made into a warm,Â chopped caesar salad. 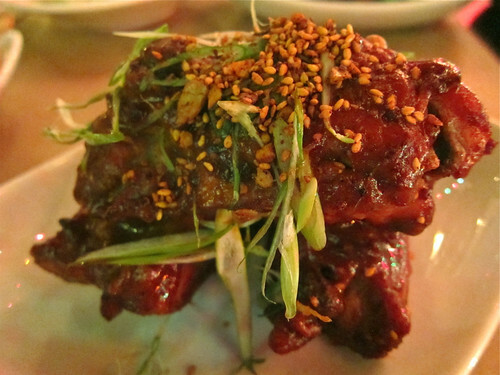 The Szechuan chicken “ribs” were to die for. They had a ton of spicy BBQ flavor and were super tender – and big. The “Cocas,” or crispy, poofy flatbreads, are have a scrumptious texture further spiced up with tasty toppings – most pizzas will seem far and away plain boring in comparison once you’ve tried. Mine had a just-spicy-enough salsa verde toppingÂ with anchovies – a perfect savory treat. There are many more dishes that I can’t wait to try at dinnertime. So between all those and all the different BÃ¤cos I have yet to try, I definitely have my work cut out for me. The full bar is yet furtherÂ enticement. It’s clear that Josef Centeno is loving having a place to truly call his own – and we, the diners, are all the better for it. This entry was posted in cocktails, Downtown LA, Food and tagged baco, bar, BÃ¤co Mercat, beer, Coca, cocktails, Dinner, Downtown LA, downtown los angeles, DTLA, full bar, gastropub, Josef Centeno, L.A., lunch. Bookmark the permalink.